Special thanks to Dr. Oberhauser for providing her time and expertise in responding to your questions below. 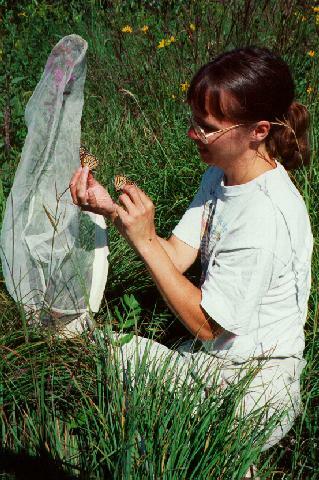 Be sure to explore the rich resources on Dr. Oberhauser's Monarchs in the Classroom website. Interested volunteers can help with research this season through her Monarch Larva Monitoring Project. Q: Last August 24th a Monarch laid eggs on common milkweed in my yard. Other years we have had egg laying in July and August with much less in the earlier summer months. Maps don't show North Carolina as a late-summer egg-laying area. Are these monarchs early migrants on their way to Mexico or are they the next to last summer generation venturing south? A: We are documenting more and more monarch egg-laying in southern states in the late summer through the Monarch Larva Monitoring Project and other observations. If you go to the results page of this site and click on your state, you’ll see that other people are seeing the same thing. The monarchs laying these eggs are moving south, perhaps to escape coming cold temperatures in the north, but are very unlikely to get to Mexico. A: There are many reasons that we think the population was so low in 04/05. These include winter storm mortality during 03/04, a cold and wet summer breeding season in 2004 that led to fewer monarchs being produced, and habitat deterioration in Mexico and the US. Luckily, the population did rebound somewhat in the winter of 05/06, but many monarch biologists are concerned about the extremely dry conditions in Texas that these monarchs will face as they head back north. Q: These three questions are based on a dead monarch that was found in our town of Perrysburg, Ohio in January. Do butterflies decompose? We are surprised that after two months of being in our classroom, the colors on its wings are still very vibrant and the body intact. A: If the butterfly is dry, it will last a long time without decomposing. There are insects in collections that are over 100 years old! Q: How did the butterfly get to Northwest Ohio in January? Is it possible that the chrysalis was formed late in the fall and it opened up during our mild January weather? A: My guess is that this was an erroneous report! Unless you had mild weather in November and December, the chrysalis would have been killed outside. They can’t stand long periods of extremely cold temperatures in any life stage. Q: How fast can a monarch fly? How do they know how to find a good air current that will take them in the right direction? Erik Grade Three Ferrisburgh Central School. A: This answer will depend a lot on wind and also temperature conditions. Sonia Altizer and Caterhin Bradley at Emory University in Georgia recently published a paper in which they reported the results of a study that involved measuring the flight speed of monarchs in the lab. When they weren’t tired (at the beginning of their time trials), they flew about 6 km per hour. They can probably fly faster outside, but it’s difficult to measure this under constant conditions. We do know that it takes them about 2 months to get from the northern part of their summer range to Mexico, about 3200 km. We don’t know exactly how they find good air currents, but they seem to be very good at this! A: Hi Lee! I’m glad you like our book. I’m going to refer you to my first answer above to the student from North Carolina. This pattern is very pronounced in Texas (see www.mlmp.org) and we would love it if you would join the Monarch Monitoring team and report your garden observations! Q: Why have so many monarchs appeared in the state of Arkansas this early in the spring when there is little or no milkweed available for egg laying? A: We don’t know. This seems maladaptive, but it is possible that there is milkweed available in places you aren’t looking. They may also have stayed in Texas through the winter, and are moving north; we’re seeing some monarchs throughout the year in Texas where people are cultivating tropical milkweed. Q: Why do some of the monarchs we are seeing in southwest Arkansas appear to be worn and faded and the others appear to be almost brand new? Could some of them have over wintered through our mild winter, much like they do in Mexico? A: It is likely that worn monarchs you’re seeing have either come from Texas (see my answer above), or they could have left Mexico early. Since I’m not sure when you wrote this question, I don’t really know the timing of your observations. Q: I live in a rural setting and it is always pretty windy. What can I do to attract monarchs, in particular, or all other species of butterfly? A: Plant lots of flowers and host plants for them. Here is a link to a site that gives you information about planting a butterfly garden - . Of course, you would have to adapt this to your location in Ontario. Q: Is there anything I can do to encourage egg laying in my garden or home area? A: The link above will help with that. A: Don’t spray pesticides, maintain a diverse plant community in your yard, and try to get your neighbors to do the same. Q: Are there any Monarch butterflies on Maui, or any of the Hawaiian Islands? If so, which island and what time of year? A: Yes, there are monarchs on Hawaii. They are there year-round, and do not migrate. I know that they’re found on the big island of Hawaii and Oahu for sure, and may be on other islands as well. Q: We have noticed that there are monarch caterpillars on our butterfly bush. We already have eleven! (Today is March 13th.) Why are monarchs reproducing now? Will the adults that develop from these caterpillars make it to Mexico ever? A: I think it’s likely that these caterpillars were laid by monarchs that never went to Mexico. We’re seeing more and more monarchs that don’t migrate all that way, but stay in Texas. This seems to be more common when people have planted tropical milkweed, since most native milkweeds die back in the winter. No, these monarchs will never go to Mexico – only the generation that’s around in late August and September migrates to Mexico, and the adults from these caterpillars will only live through late April or early May. Q: The cocoon is exquisite. How does the butterfly spin a green lantern with golden dots precisely placed? A: First, butterflies don’t make a cocoon; a cocoon is a silken covering made by some moths to cover their pupa. The green coloring of the monarch pupa, or chrysalis, is the actual skin of the monarch during this stage. A: Arturo, this is a wonderful question! We actually know very little about the paths that the monarchs take through Mexico on their way to the wintering sites in the Fall, or back from the sites in the Spring. Maybe you can help us figure that out! A: This is a hard one to answer, since it’s difficult to count either the dead butterflies or the living ones. We think that about 20-25% of them die, barring major disasters. Most important causes of mortality are bird and mouse predation, desiccation (drying out) and starvation. Q: Why did so many of our caterpillars die this last fall from the monarch lab...we only tagged 25 of our 200 we received and were really sad...........we washed hands, etc. to avoid parasites but can't figure out what it was. Thanks, Karen. Hope all is well with you. Did you go to Mexico this winter? Paulette Hauge 6th grade teacher at Kimball Elementary School! A: Hi Paulette! I did go to Mexico this winter, and was thrilled to see that the colonies were larger than they were when I was there last year. It was an amazing trip, since I was there just before they left for the US, and were, therefore, very active. We did have problems in our lab last year, and you should receive our newsletter with a discussion of this very soon. Here is a brief summary: We have come up with two possible reasons for this. The first is a microsporidian disease called Nosema. This is a widespread group of organisms that are found in many insects, and there is a group within them that infects Lepidoptera. They are spread very easily, and are extremely contagious. We’re not sure where the infection came from, but it is sometimes used as a biological control agent to combat insect pests, like corn borers and gypsy moths. One report said that Nosema is sometimes used to control greenhouse pests, and may have even been in the potting soil that we used. The second possibility is something called nuclear polyhedrus virus (NPV), which would cause them to turn black and sort of gooey. 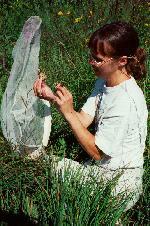 This is also used as a biocontrol agent, and is airborne and especially common in the fall. Both of the above diseases are very contagious, so would have spread quickly from larva to larva. Please assure your students that there is nothing that they could have done about this disease, and that they did nothing wrong. It's like a disease that spreads through a human population that has no known cure. Additionally, assure them that neither of these diseases can be transmitted to humans! Q: How do the Monarchs survive in Mexico? A: They store up a lot of fat in their bodies that they can use to stay alive all winter, since they don’t have much or any food in Mexico. Also, the cool temperatures there slow down their metabolism so they can stay alive longer than they would up here in the summer. Q: Where do they sleep and what do they eat? A: They sleep on the trees, and, as I said above, eat little or nothing. There are some flowers near the colonies, but nowhere near enough for all of the butterflies. They do need to drink water though, and depend on streams in and near their winter sites. Q: How do they know when it is time to come back? A: We think they can tell by the day length when it is time to leave for the United States breeding grounds. Q: How can we tell whether the monarch butterflies we have now over wintered here in southeast Texas or are migrants? A: The number of questions about early monarchs in the south makes me suspect that there are more this year than in past years. I’d be interested in hearing if you think this is true! There are two ways to tell; one is not definitive, but doesn’t result in dead monarchs, and one is definitive. First, you can surmise where they came from by the timing of your observation. If you see them in February or early March, it is very unlikely that they migrated from Mexico and more likely that they are the offspring of butterflies that wintered locally. If you see them later, especially if you haven’t been seeing monarchs for several months, you can surmise that they re-migrated from Mexico. You can also analyze the monarchs to see what kind of milkweed they ate when they were caterpillars, but this requires killing them and having access to specialized equipment. If they ate common milkweed or other northern species, they are migrants, since they must have been larvae in the northern part of the United States or southern Canada. If they ate local Texas species, they are the offspring of butterflies that laid eggs in Texas. This is the technique used by Stephen Malcolm and his colleagues to determine how monarchs re-migrated into their northern breeding ranges – if they flew all the way from Mexico to the north, or if they had an additional generation in the south before getting all the way north. Q: About how many monarch butterflies are there in the United States? Thank you. We are a first grade classroom in Glen Ellyn, Illinois. A: This would be very difficult to tell with a great deal of accuracy, and would depend on the time of year. At the end of the summer, a good estimate of the number east of the Rocky Mountains is probably almost a billion. If you included the monarchs west of the Rocky Mountains, the number might go up a few million or so. Q: How many years have you been working with butterflies? Q: How many years do butterflies live? A: Monarchs that migrate live about 6 to 8 months. Those that don’t migrate live about one month. Q: What is your favorite question people have asked you over the years? A: It would be hard to choose my favorite question. My favorite kind of question is one that I don’t know the answer to, because it makes me think about new things about monarchs! After 22 years, it’s nice to think about something new. Your question about the number of monarchs in the United States really made me think! Q: We are located in Seattle, Washington. We have classes participating in the Tulip Program and the Whooper migration. I have checked the open spaces around our school, and can't find milkweed plants. My question is; if we raise milkweed, and raise the caterpillars, will Monarchs fly south to Mexico? We have not witnessed a monarch population in Seattle. How would they "know" where to migrate? A: You’re right, there aren’t a lot of monarchs in Washington, and I don’t know of any reports of any from Seattle. If you did raise monarchs there, they would be more likely to go to the wintering sites in coastal California than Mexico. We don’t know how they know where to migrate. In my opinion, this is one of the most amazing natural mysteries there is. Q: We are very familiar with salmon migrations and the "cues" they get to return to their spawning grounds but they are a higher order species and they spend considerable time in their hatching environment. If monarchs were raised in a non-traditional area where would they migrate when they leave Mexico? Does food availability serve as the primary "cue" and would they follow the food source? A: I’m not sure that I would consider salmon a higher order species than monarchs. Both have evolved over many eons, and have adapted to fit their particular environmental niches extremely well, or they wouldn’t be around. Monarchs don’t learn how and where to migrate, but it’s almost more amazing that they have the right instincts that allow them to carry out this amazing migration with no learning. Thus, a monarch put into the winter colonies would probably be able to migrate appropriately, although this has never been tested, to my knowledge. We don’t know if food serves as the primary cue for spring re-migrants. A: Fred Urquhart first studied the gold spots on monarchs in the 1970s. He felt that the spots were involved in the distribution or formation wing scale coloration. However, the experiments that he did involved cauterizing the gold spots on the pupa, and it is possible that this process may have damaged the underlying tissue and affected the color patterns. Interestingly, all danaine butterflies (monarchs and their relatives) have metallic spots on them. A group of researchers in Germany did a careful study of the properties of these spots. They are not metallic, but the cells reflect light like metals do, giving them the appearance of being metallic. Other danaids have silver, copper, or gold spots. a) camouflage – they could reflect colors of the surroundings and break up the shape of the pupa; they might also look like dew droplets. d) They might not have any function, but just be the result of something else in the cuticle of the insect. A: The changes that occur as the monarch changes from a caterpillar to an adult butterfly are so major that it is best that the monarch is in a still life stage during this time. A: The egg is made inside the female, sort of like a chicken egg is made. All of the parts of the egg are put on as it moves down a long tube in the female called an oviduct. A: While the process of complete metamorphosis looks like four very distinct stages, continuous changes actually occur within the larva. The wings and other adult organs develop from tiny clusters of cells already present in the larva, and by the time the larva pupates, the major changes to the adult form have already begun. During the pupal stage this transformation is completed; in many ways it’s similar to the process of development that occurs in a human embryo – organs form and grow from specialized cells. Despite what some books say, the monarch does NOT turn into liquid during the pupa stage. I’m not sure where this mistruth started – maybe someone dissected a dead one and it had liquefied. You can read a lot more detail about the process of metamorphosis in a good insect encyclopedia or on the web. A: I have no idea what happened to your milkweed; I’ve never seen this before. It sounds like some kind of a fungus. Q: Karen, I was on the tour with Bill Calvert from March 4 -11 and was thrilled to meet you. I have shared my trip with all my students and these questions come from that sharing. I don't know the answers. Thanks! If monarch butterflies can die in a puddle of water why don't they die when it rains? A: It was so much fun to meet your group in Mexico! I hope that you had a good flight back to VA! When it rains, monarchs usually find a somewhat protected spot, like a tree where the branches and leaves shelter them, or a heavy bush. They fold their wings, and stay still. When the sun comes out, they open their wings and hold them out until they dry. Q: When a mouse eats a monarch why doesn't it get poisoned and throw up? A: This is a great question. The mice that live in the monarch wintering areas may have evolved to be able to tolerate the toxins in monarchs. However, one summer there was a chipmunk (or many chipmunks!) that found my monarch cages and ate a lot of the pupae. I’m not sure if it made them sick or not, but they kept coming back for more. Q: Why do butterflies flutter their wings while they are drinking from a puddle? Is it to keep their wings dry? A: It’s funny you ask that, because we were watching this at one of the colonies in Mexico this winter. We came up with the following hypothesis: the water is slightly colder than the air, so the butterflies need to keep their bodies warm enough to fly. Fluttering their wings warms up their thoracic muscles. A: Hi Barb and Lake Elmo Students! Another good friend of mine from Minnesota, Paulette Hauge, asked the same question, and I’m going to refer you to her answer above to save space on this long list of questions. And I’m going to forward this file to De so that she can answer your last question! Q: Question for De: When De was here she said we could make new milkweed from the tropical one we have. It is almost as tall as Mrs. Frederick. Do we cut it at a special place? Do we put it in water or in dirt? A: Hello to Mrs. Fredreck’s lovely Kindergarteners! Yes, new plants can grow from “cuttings” of old plants, especially if they’re as tall as a teacher! Now that spring has arrived, and the days are getting longer (…more light! ), it’s a GREAT time to try this in your classroom. Cut the stem(s) into approximately 12 inch lengths, and remove any remaining leaves from the bottom half of the stalk. Place the stalks in a container of water on your windowsill. Roots should sprout from the places where leaves previously grew. Once you have a lot of little roots, plant your cutting in soil. And don’t forget to keep watering the original plant. It will sprout new growth from the places you cut. Good luck!